However, the Huawei MediaPad 7 Vogue packs a rather outdated quad-core Cortex-A9 CPU, which isn’t exactly known for its power-efficiency. We were quite interested to find out how those two balance out. 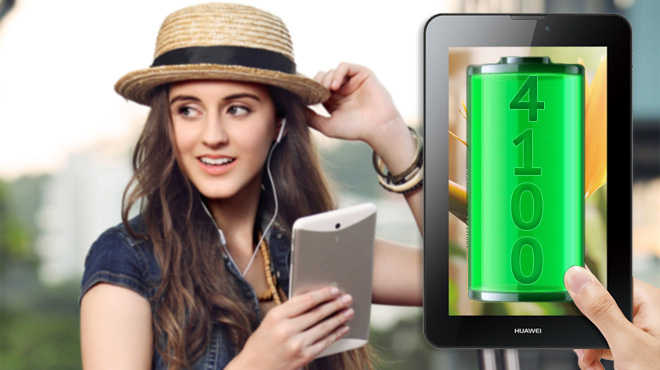 The MediaPad 7 Vogue flaunts a SIM card slot as well, allowing it for an entry in the talk time test. It played right into the slate’s strengths as the large screen stays off and the chipset is idling. Unsurprisingly the MediaPad 7 Vogue took advantage of that and made its battery count, scoring 22 hours and 16 minutes here. Somewhat strangely, though, it failed to beat or even match its Ascend Mate sibling which has a 100 mAh smaller battery. The Huawei MediaPad 7 Vogue packs a 7″ IPS display of 1024 x 600 pixel resolution, which plays a significant role in the web browsing test. The low resolution means there are less pixels to push around, but that still wasn’t enough for the less than optimized Cortex-A9 CPU to push the MediaPad 7 Vogue above the 8-hour mark. With 7 hours and 23 minutes, the MediaPad 7 Vogue came almost 2 hours short of the 2013 Nexus 7 achievement. And finally we come to the video playback test. Here, the Huawei MediaPad 7 Vogue got closer to the 2013 Nexus 7. Huawei’s slate got 6 hours and 40 minutes of video playback, which is merely 17 minutes shy of the result of the latest Nexus 7. 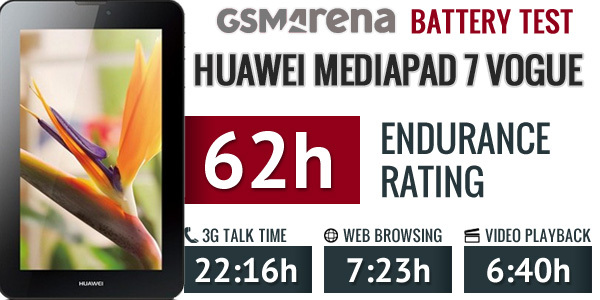 Adding the unsurprisingly good for a battery of this capacity standby, the Huawei MediaPad 7 Vogue scored an overall great endurance rating of 62 hours. That’s how long you can last between your charges if you do an hour of calling, web browsing and watching videos each a day. Of course that’s hardly the usual use case for a slate, but even if you only consider the important readings in our tests (web browsing and video playback) the Vogue still isn’t half bad.